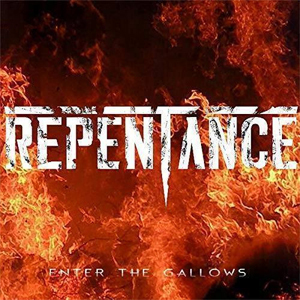 REPENTANCE Stream New Single, "Enter The Gallows"
Earlier this year, REPENTANCE hit the scene with a pair of back-to-back demos, released exclusively on YouTube, ahead of their live debut with TRIVIUM. Now, the band enters Fall with the release of “Enter the Gallows”, an epic display of new American metal and their first “official” single, available now on Spotify, iTunes, Apple Music, Amazon, YouTube and more. “Enter The Gallows” was recorded at Electrowerks Recording with Chuck Macack (BORN OF OSIRIS, OCEANO) engineering. The track was mixed and mastered by Chris Collier (PRONG, KORN, RIOT V) of CMC21 Productions. REPENTANCE will play Wisconsin for the first time on November 12, 2018 supporting DEVILDRIVER, JINJER, and RAVEN BLACK at Route 20 in Sturtavent, WI.